Author(s): Mahboobeh Taziki, Hossein Ahmadzadeh, Department of Chemistry, Ferdowsi University of Mashhad, Mashhad 1436-91779, Iran. Marcia A. Murry, Stephen R. Lyon. Background: Both land-based agriculture and aquatic algae culturing systems require a steady supply of macronutrients, primarily nitrogen (N) and phosphorus (P), in addition to a variety of micronutrients for biomass production. The use of commercial fertilizer for large-scale algae production significantly increases the cost of algae production. Microalgae have a high capability to remove combined nitrogen compounds, ammonia, nitrate and nitrite, from wastewaters. Methods: The algae assimilates inorganic nitrogen and converts nitrogen into biomass, thus providing an opportunity for efficient recycling of nutrients in wastewater. Furthermore, the microalgae can be a feedstock for biodiesel and other valuable by-products including pigments, proteins and lipids. Combined nitrogen is assimilated in different forms and at different rates that vary among the phylogenetically diverse strains of microalgae. Results: In this review, we summarize nitrate removal rates and biomass production of different microalgae species reported in the literature. Conclusion: A comparison of the literature suggests that Chlorella vulgaris, Neochloris oleoabundans and Dunaliella tertiolecta are able to remove nitrate more effectively than other strains studied. Moreover, important parameters influencing nitrate removal, including initial nitrate concentration, light intensity, pH and temperature, are discussed. Alternative culture methods, immobilization and biofilm formation for nitrate remediation, are introduced which are able to lower costs of the harvesting process. Keywords: Biomass concentration, microalgae, immobilization, nitrate removal rate. Affiliation:Department of Chemistry, Ferdowsi University of Mashhad, Mashhad 1436-91779, Iran. Keywords:Biomass concentration, microalgae, immobilization, nitrate removal rate. Abstract:Background: Both land-based agriculture and aquatic algae culturing systems require a steady supply of macronutrients, primarily nitrogen (N) and phosphorus (P), in addition to a variety of micronutrients for biomass production. 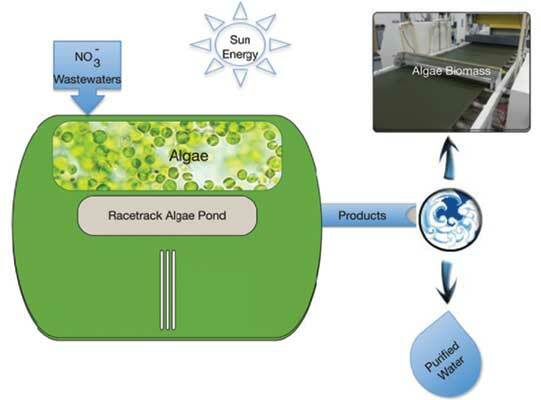 The use of commercial fertilizer for large-scale algae production significantly increases the cost of algae production. Microalgae have a high capability to remove combined nitrogen compounds, ammonia, nitrate and nitrite, from wastewaters.